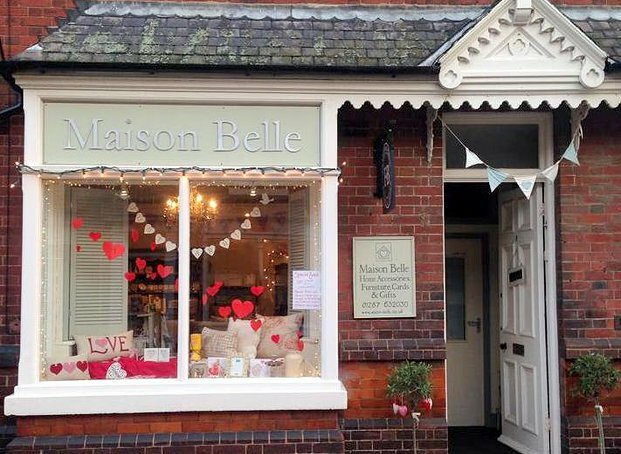 I start this post with some fantastic news ..
After successfully selling some little bits and bobs in gorgeous Guisborough shop Maison Belle, I’ve been asked by the wonderful owner Laura to have a more substantial presence there. So, from 11th Oct I’ll be one of the ‘Maison Belles’ The four artists she has asked to join her in the shop. Not only will we be retailing alongside Laura’s own stock and work, you might just find us in there holding the fort! With me and Laura will be my best friend Geraldine of ‘Bean Creative’ (with whom you’ll often see me sharing a stall or doing a workshop ), Abi of ‘Oh Abigail‘ … another wonderful friend and painter of the most amazing handmade signs, and by no means least my friend of 30+ years since we were at Art College together, Kim from ‘Daisy Bloom‘, purveyor of the most stunning bags, scarves and jewellery. Allowing us to sell and help in the shop allows Laura to concentrate on her new project, the prettiest little cottage literally doors away from me! Couldn’t be more excited. My obsession with tea started as a child, and as a young adult was soon exposed to the delights of Earl Grey. I have passed this on to at least one of my children, with my son drinking Earl Grey with lemon from the age of 8, and seeking out the tea section in Harrods the last time we visited. Running a teashop I could totally indulge in my love of tea and helped by Carly the owner of The Old Young Teahouse I filled the shelves with all manner of interesting brews… a year on from my exit from the shop and I am missing being around the stuff , so after a great conversation with Rockwood & Hoot’s Jane , I’ve decided to sell teas! I’ll be selling under my own Ruby & Blue brand and you’ll be able to buy soon at Maision Belle as well as order here. Crack out the china teacups! What an amazing time we had at The Festival of Thrift at Lingfield Point in Darlington .. 20,000+ people came on day 1 and more on day 2 … It was buzzing! The stallholders, food , entertainment and classes were all superb and Geraldine and I had an absolute ball (if a tiring one!) The photos tell the story (and you can see my Ruby van in the last one). Totally booking for next year!